Sunday evening February 28—the highlight of Black History Month—America will be glued to their TV sets watching the Academy Awards—for which not one single black actor or actress or director has been nominated. If it weren’t so typical—the rule rather than the exception—it would hardly be noticed. But for some reason it has been noticed, even by the LA Times which published a stunning group photo of all the nominees on their front page Oscar issue—A Whiter Shade of Pale if there ever was one. Why should this retrograde action on the part of the Motion Picture Academy be of concern to a folk music magazine? Because we have heard from all corners of the academy (the academic world, not of motion pictures only) that the election (and re-election) of America’s first black president was a signal that the “race problem” in America had been solved, that we now lived in a “post-racial society,” the actual title of a forward-thinking academic book that we no longer had to worry about such things as racism, discrimination, segregation, Jim Crow, and so on—clearly black people were no longer being held down—so if they weren’t succeeding it was (to borrow a line from songwriter Jimmy Buffett) “their own damn fault.” Moral: we no longer needed Affirmative Action. The Supreme Court affirmed Wilbur C. Rich’s thesis—The Post-Racial Society is Here—by virtually expunging the 1965 Voting Rights Act from the law of the land, and allowing states once again to monitor their voting laws with no supervision from the federal government. They could return to the pre-civil rights movement standards of states’ rights policies that made it as difficult as possible—or even impossible—for black people to vote at all. As we enter the home stretch of the presidential election—as Martin Luther King, Jr.—whose birthday we celebrate today— said in his I Have a Dream speech—now is the time to bring the soundtrack of the civil rights movement to bear on this significant new sign that the clock is being turned back on fifty years of civil rights progress. That soundtrack is virtually identical with the best folk music of the decade of social change that produced it—freedom songs of the 1960s. Life Magazine was there to document the performance and the following month, in July, Dylan sang it at the Newport Folk Festival—and then on August 28 at the March on Washington. Two years later in Selma, Alabama the march to Montgomery began which led to the signing of the Voting Rights Act of 1965. Last year’s hit movie Selma told the story as well as it could be told without licensing the rights to King’s actual words—now controlled by King’s heirs who have done all they can to keep them out of the public domain. Even within those limitations, however, the film gave a powerful, memorable account of the events that led up to the march—including the first attempt at marching across the Edmund Pettis Bridge on what became Bloody Sunday. 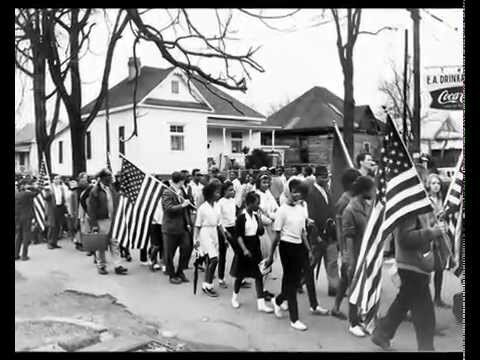 On the second, successful attempt to march across that notorious landmark in Selma, the movie adds an inspiring soundtrack of freedom and antiwar songs sung by Odetta and Dylan. It’s a magical moment when history and music come together and the power of song to help change the world is underscored. Yet here we are, just one short year later and it is as if history never happened, Selma never got made, and the slow clock of progress has been ticking backwards ever since. How about this for a contemporary version of the same song? Marching up to freedom land! Happy Martin Luther King Day. We Shall Overcome.